Fraud is a rising problem in influencer marketing, so Influencer marketing platforms are making fraud ‘very obvious’ for brands to identify, as Kerry Flynn writes for Digiday. Need a quick dive into IGTV? Here’s What Content Creators and Brands Need to Know About IGTV from Emily Farlow for SHIFT Comms. The Ugly and Beautiful Truth About Content Audits from Bernie Borges for Social Media Today covers just about everything you need to know in order to kick off an in-depth content audit. File under “Important Things”: 3 Takeaways for Communicators From U.S. Sen. Warner’s Paper on Social Media Regulation from Justin Joffe for PR News. If you want to run an Instagram contest, be sure you know How to Play by the Rules with Instagram Contests (Including Examples) from Dana Kilroy for SMT. 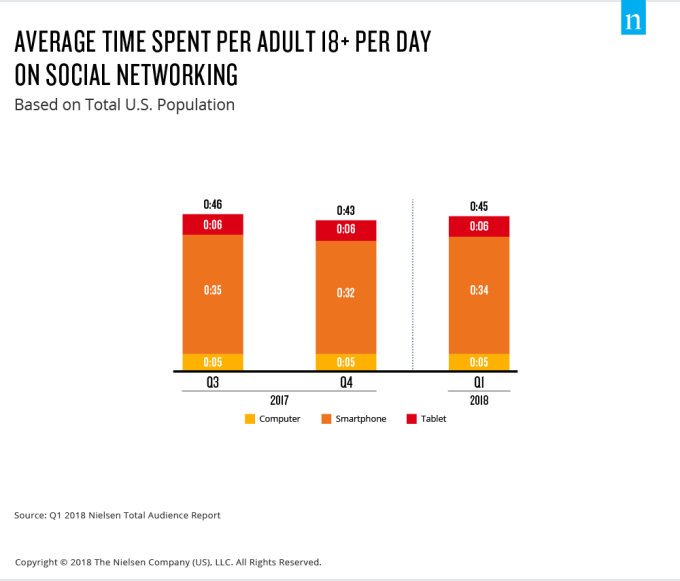 “Beyond video, Nielsen’s report also examines social media adoption. It found adults are spending an average of 45 minutes per day on social media, with the majority of that time on smartphones.